﻿ Is an opossum that is active during the daytime sick or rabid? Opossums are nocturnal animals in general, but at times you can see them during the daylight hours. In most cases, people will get scared once they see such an animal out in the open during the day and they may assume that that opossum is sick or rabid. Seeing an opossum out during the day is not that abnormal. You can see an opossum during the daytime especially when the weather is cold. You can also see them where the sources of food are scarce and so they have to look for food for longer hours before meeting their required daily intake. Also, you may see them during the day due to disruptions at the areas where they had been sleeping. In the winter months, the opossums change their habits a little, especially when it comes to foraging. They can choose to forage during the day because at times it is a bit warmer out because there is sunlight on some days. They will usually feed and go back in to inactivity once the temperatures fall again. Opossums are rather resistant to rabies. This is something worth noting because most people fear them because of the possibility that they actually have rabies. 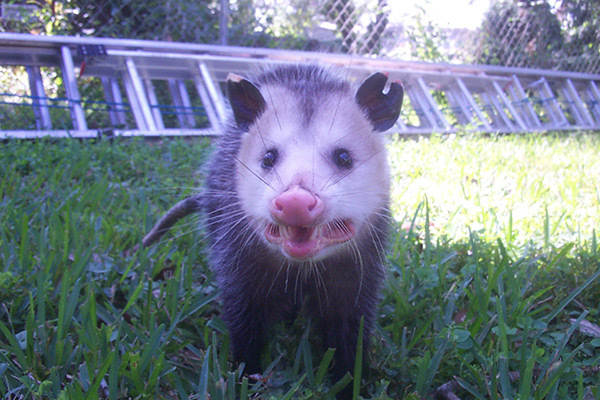 You need to know that it is very rare to come face to face with a rabid opossum. If you are scratched or bitten by one, you need to get help from a physician immediately. An opossum attacking is rather uncharacteristic and you can consider this as a warning sign that it could be rabid. When you see an opossum out and about during full daylight, there is no cause for alarm. However, if you see some obvious signs of disease such as a ruffled coat or obvious signs of injuries, you should get help immediately. Never try to handle the animal all by yourself. The animal could be just looking for a new shelter or it could be hungry foraging for food. It is always advisable to steer clear of the animal at all times. If the animal is wreaking havoc in your homestead, you need to trap and relocate it as soon as possible. If you are not comfortable doing this yourself, you can call a local wildlife removal company and they will take care of the problem for you quickly and with no hassle.